Oh boy, did I have fun with this card! I used three different sets from Doodle Pantry to create this scene. I used the brand new set Rooster, and two older sets Old Barn and Wagon Wheel. Because I wanted to use the colored versions of each of these images, I had to remove a couple of things using my computer software Fireworks. I removed the grass and sky from the Old Barn, the sky from the Wagon Wheel and the piece of board from the Rooster. I didn't have to do anything about seeing the outline of the grass on the Old Barn because the fence covered it up nicely. Although I used all pre-colored images, I did need to color the ground behind the fence and because I used the wrong color, it matched the fence too closely, so I needed to darken the fence a little bit. I just love the way this scene came out. I added the sentiment and a little bit of black bling then layered it on black, cherry cobbler and white card stock. Amazing Susan. Love your card, so creative. Wish I was so computer literate. 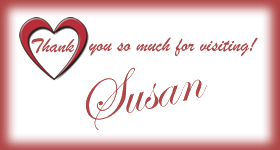 Susan - this is beyond fabulous in how you integrated all the different images to create this fabulous scene. I really love it. Whoa. I have no idea how to accomplish the technology you just described, but it sounds like a lot of work...and the results are gorgeous!! It is a wonderful farm scene and reminds of my Granddad's farm oh so many years ago. Love that you added the rooster too! Terrific job! WOW, Susan! This is an incredible blend of images. Such a perfect card. This is an amazing card. I believe I could just step into the scene. Absolutely gorgeous. You really outdid yourself on this one. I love merging different sets and this scene could not be more perfect! What a wonderful job putting the set together Susan! Gorgeous card! OMG...another wonderful card. Love how you merged 3 different images...fabulous! Somehow I am missing post. I am going to check to make sure I am following you using email since I'm missing some of your great posts. What a great card. What software did you use? I've been trying to find a good merging software for awhile! Amazing - and OMG great computer skills - love how you merged them all and created a beautiful scene. Oh Susan, gorgeous! I love scene cards and this one is amazing!